How Do You Appeal To Your Women Consumers? Marketing to women and appealing to female consumers are subjects I think about all the time. They inspired this blog about the consumer retail experience and have led to many retailer and industry presentations. Flooring is far from unique, but it captures a world of extremes. For the most part, retail and manufacturing are heavily male driven while the ultimate consumer is a woman. No wonder the resulting consumer experience often misfires! Although, for those wanting to engage with and delight their [women] customers, imagine the opportunities! I got to witness the early stages of a customer-focused transformation when I attended Big Bob's Flooring Outlet Annual Meeting where the theme was "Think Pink & Best Practices". David Elyachar, aka Big Bob himself, invited me to take part in his annual session with franchise owners. Not only did I get to interact with his members, but I also shared information about marketing to women and improving the customer retail experience.... My presentation - titled "Flooring The Consumer: In-Store and Online" - urged Big Bob's Flooring owners and managers to go beyond 'thinking' pink [yes, I was definitely thinking of Andrea Learned and Don't Think Pink] to truly focusing on our core woman consumer. How perfect then to come across - on the plane ride to Chattanooga - this Fast Company article from October 2009 titled "Separate. And Equal." 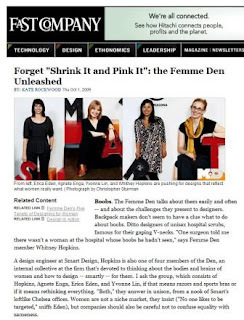 by Kate Rockwood, with the marvelous subtitle "Forget 'Shrink It and Pink It'...."
+ Women represent a $2 trillion market. + Women are not a niche market. As I mentioned in my presentation, the beauty of meeting women's higher expectations is that you also delight your men customers. American Express discovered "in doing research that women were better able than men to articulate their needs, leading to a richer discussion. They think more expansively, uncovering benefits and positionings that the company hadn't considered. In so doing, AmEx learned that by designing for women, they appealed to men, too. For example, whereas traditional AmEx material promoted a message about 19% interest rate [more male focused], women respond to a message about financial planning to protect her family. The different approach not only appeals to women, but also connects with men, and promotes more services. That's an opportunity! In financial services [as in many businesses] selling to women takes more steps, but when you earn her business, she is more loyal. Women are also better investors. Women take care of everyone else before they take care of themselves whereas men are more individually focused and take care of themselves first." I love this point from the article: "good products balance the needs of men and women for the benefit of both." + Emphasize benefits over features. + Craft a cohesive story. + Remember her life stages. Getting back to my original question, how do you appeal to your women customers? The 1/3 of sales in the front of the store is misleading and likely the result of inadequate thought and investment in lighting technology. Customers walk towards the brightest light in the store (within reason). Light can be used to reinforce circulation patterns and can be used to highlight merchandise (the brightest area should be where the merchandise is). 1) This iStock of Chicago Girl - Shopping on Michigan Avenue sums up what the exterior of the store must do within 30 seconds: capture the attention of passerby and get them to look inside and then walk into your store. Stores are competing with daylight so a compelling window display and a bright back wall is essential to catch the consumer's eye. Try this test, look in your window from the sidewalk, does anything stand out? look interesting? make you curious? 2) Getting customers into your store is a physical transition from daylight to artificial light in most stores. A space for customers to "land" and adjust their vision and pace is common practice. The size of this transition zone varies considerable from store to store depending on a myriad of factors. 3) Walkways, non-merchandise areas, and service areas need much less light than walls and merchandise. If customers can easily see what you have to sell, they are more likely to buy. Editing of merchandise is one of the most important services that a retailer provides for customers, making sure the display is compelling is the "icing on the cake." 4) Baby boomers are retiring in record numbers and with record amounts of money. Baby boomers will be buying less than they have in the past BUT they will be buying better quality, high function and usability, items that make life more enjoyable, and items that help compensate for reduced sensory function. Flooring, as an example, will need to be relatively "hard" (no pile, tight weave, easy to see, and easy to maintain for carpet) for feet that shuffle or for walkers that assist mobility. Wood, linoleum, vinyl, ceramic, and synthetic flooring will be preferred for durability, ease of maintenance, and safety. 5) Each generation has unique expectations and needs and retailers must be more attentive to the stated and unstated needs of each generation. Social media, on-line sales, links to supplier sites, and easy price comparisons are part of the retail experience; ignore these and risk sales. 6) Retail is a verb that implies thought, and action to create a compelling and pleasant retail experience. Why would anyone visit your store? What value do you have that another retailer does not? What 20% of merchandise is responsible for 80% of your sales and profit? Do you meet your customers' needs? What can you do better and smarter to insure the future of your business? Thank you for your continued discussion on the business of retail and flooring, Arthur. I'd love to hear what your experiences have been using light to draw customers into your retail store. New year, new beginnings, so what's in store for your store? Perhaps it's time to refresh your store experience for the New Year? From Retail Customer Experience Magazine, here are 5 signs your retail store needs a makeover by Bob Phibbs. 1. How does your store flow? How well does the traffic patterns you've established match up with those of your customers? Do you need to adjust them? 2. How consistent is your store? My favorite example of retail experience consistency is Target. Signage, communications, baskets, even the bathrooms consistently say 'Target.' Are you that consistent? Could you be more consistent? Or, if inconsistency is part of your retail experience, are you consistently inconsistent? 3. Can you simplify your merchandising? Can you edit your product selection? Make it less overwhelming for customers? Can you be a curator for your category? Unnecessary complexity will scare customers away. Demonstrate your passion and expertise by simplifying and editing your assortment. 4. How fresh does your store look? Does it need dusting? A new coat of paint? Are your flyers, signs, announcements current? Do you need to replace dead light bulbs? I love this quote: "... great retail is like an idealized home..." which means your store needs to look similarly engaging. 5. What about your displays? Do you rotate them on a regular basis? I love what Aggieland Carpet One does with its displays: put them on wheels! Per the article, "Eighty percent of your sales tend to come form the first third of your store, so highlight all of the "wants" at the front and all of the "needs" in the back..."
What else do you ask yourself when you step back to consider your store experience? And, by the way, these questions are just as relevant for your online presence. Are you familiar with McKay Flooring Ltd and its Director, Richard McKay? McKay Flooring Ltd is a UK based hardwood flooring company. Established in 1973 in Glasgow, Scotland, it is now one of the largest UK companies of its kind and has recently opened a showroom in London. Its Director is Richard McKay. If you spend time on the McKay Flooring website, you'll notice many customer-centric elements: sharing/bookmarking tools, contact us options that include Twitter and Facebook in addition to phone and email, and the McKay Flooring Blog - a visual feast for the eyes, although the newly launched posterous blog Floorcrunch is even moreso! McKay Flooring Ltd. features prominently in the Social Flooring Index. Definitely not your typical flooring retail experience! You can understand why I consider McKay Flooring to be Flooring It Differently. Richard McKay shares his insights in the following interview. C.B. : Richard, tell me about yourself and your company. R.M. : McKay Flooring were formed in 1973 by my father Archie McKay. The company were originally a general floor coverings contractor for soft floor finishes and wood flooring. Over time the company concentrated on the wood flooring side of the business especially Junckers sports flooring installation and renovation. We now have two retail showrooms and supply, install, refinish wood floors on both domestic and commercial contracts. Our commercial division undertakes work across the UK and have been involved in projects for Microsoft, Turnberry Hotel and Golf Club (where the Open was held this year), McDonald's European HQ (to be completed in Feb 2010) and numerous schools, sports centres across the nation. Our online store was launched in November 2009 and has already made an impact on our sales. I graduated with a degree in Quantity Surveying and worked for two construction companies before starting my career with the family business in 1998. I now run the company on a day to day basis. Whilst studying for my degree I had a feeling that I may end up working for the family business but wanted more experience doing my own thing first. My degree helped me with the commercial contract side of the business but now I'm learning new skills to help us build up the online and retail divisions. C.B. : How did you get involved in social media? R.M. : Back in 2008 my friend recommended that I look at blogging, Facebook, Flickr, YouTube,Twitter etc. to help our online marketing efforts. We were keen to organically increase hits to our website and decided to jump right in and see what worked for us. We were also inspired by BuildDirect who are leading the way in leveraging the web to market their business using blogs and video. C.B. : How do you personally and your organization use social media for business? R.M. : My personal Twitter account (http://twitter.com/richardmckay) is used for sharing both work and non-work related links. When I first started tweeting I thought of Twitter as a broadcast medium like TV where we could pump out flooring deals, company news and other promotional tweets. However as I started using it I soon realised that this wasn't the way to leverage Twitter - it is much more powerful for building up relationships and awareness of yourself and/or your company and for listening in to the conversation. Having direct access to industry thought leaders via Twitter and blog commenting is a great way to foster meaningful relationships. My personal tweets are usually shared tech links that I find interesting, local Scottish news, retweets of people I follow, updates from my Posterous blog and news snippets about my soccer team (Celtic FC). I'm also on Facebook which is primarily for people I know in 'real life'. LinkedIn is becoming another important online destination although I need to spend more time there and work out a way of using it more effectively. One of my most enjoyable daily tasks is reading through Google Reader to catch up on all the blogs I follow in feed format. In the last 18 months I've learned more about social media, flooring news and our competitors than I could have ever imagined. It's my killer app! McKay Flooring's use of social media revolves around our blog. We auto update our Twitter and Facebook accounts every time we post on the blog. This increases the exposure of each post with minimal effort. We also track industry keywords being used on Twitter using CoTweet and Tweetdeck. Another social media site we are using more is Flickr where we are building up a library of flooring photos. In 2010 we have also launched a new Posterous blog - Floorcrunch - for flooring products we discover online and which we'd like to share. Another area we need to develop is our online video presence which we'll tackle in a few months time. C.B. : What do you like most and least about flooring? R.M. : I like the ever changing range of products in the flooring business and also the effect a new floor can have on someone's living or work space. I don't really have a dislike but I suppose that flooring is harder to sell online than other products. We see this as a challenge rather than a problem. C.B. : What suggestions do you have for improving the flooring retail experience? R.M. : I think it's always important to be improving all aspects of the customer experience from properly trained and knowledgeable staff, an easy to navigate and informative website and a well lit showroom which is continuously being updated with new products. R.M. : From a personal viewpoint I like the direct access social media gives you to people. On a business level it's an effective yet inexpensive way to build your brand online. C.B. : Is everyone in your business involved on social networks? R.M. : Not yet! We'll be working on this during the first quarter of 2010. Power to the tweets! C.B. : How do you manage all of the different channels? R.M. : We use auto updates so that an status update on one service will automatically update our other social media channels. There's also a few staff who are now primed in social media and here to lend a hand. C.B. : What advice do you have for others wanting to get involved with social media for their business? R.M. : Allocate an hour per day and open up a Twitter, Facebook and LinkedIn account to start with. If you've not got a blog then get one started using Wordpress or Blogger and schedule a weekly update on any business news, views or case studies. Start linking your blog posts on your social media accounts. Search for interesting people in your industry and follow them and get chatting. Use a feed reader (I recommend Google Reader) and subscribe to blogs, news, Google alerts to discover what's going on in your industry. What do you think about McKay's online presence? What about how they use images to bring the wood flooring category to life? How would you apply these insights to your flooring or other business? Phil Pond & Scarlet Opus: Focused on Flooring Products That Floor Consumers! I recently 'met' Phil as a result of the Carpetology post on Celebrating Carpet: UK's Fun On The Floor With Style. We quickly discovered a shared passion for the consumer and frustration with the flooring retail experience. He and life/business partner Victoria Redshaw - whom I hope to meet in person at Surfaces 2010 - share a common aspiration to make flooring manufacturers provide retailers with products consumers actually get excited about buying – just as they do wallpaper and furniture. Phil Pond's experience spans 30 years in international sales & marketing with companies such as Mars Inc. It also spans every continent. He's been involved with the Flooring industry since 2003 [as have I] with manufacturers in the UK, China, UAE and Scandinavia and in retail with Harrods. In the US, he built flooring manufacturer representative teams for two UK businesses one of which was Brintons. He owns 50% of a small custom UK Axminster manufacturer and 50% of a sourcing company based in Qingdao China. Scarlet Opus operates in Europe, China, India, the Middle East and soon the US! It's definitely a family business as one of his 3 children, Shelley, works in Scarlet Opus Dubai. Phil shares with us the following article. A family favourite forever these majestic animals according to experts have reached the end of their evolutionary road. All that is in store for the giraffe now is to travel slowly toward natural extinction as Darwin’s theory dictates. Darwin’s theory of evolution sees the strongest and most adaptive of a species survive their ever changing environment through ‘natural selection.’ Does the carpet & flooring industry have some giraffes? Maybe a few dinosaurs? You might think our ideas contentious but we only report the trends and maybe cause a few to move through the evolutionary process of the carpet/flooring retailer. Consumers will require a more experiential service, but will spend more on each purchase buying goods that last. Retailers making the buying experience a pleasant and rewarding one will win. Consumers want a choice but not confusion; want guidance with freedom and want straight forward trading. Some retailers have already responded and made necessary changes: opening showroom spaces by reducing the range of products displayed; de-cluttering a mass of POS ‘stuff’, focusing with fewer suppliers - maybe only 2 of each carpet/flooring type. It may surprise you how positively consumers react when offered a good but not overwhelming choice. More choice adds more confusion to the consumer’s decision making which inevitably takes longer. A small seating area, in which consumers can relax and talk about their choices, samples and their plans amongst themselves and with you will secure more orders from more people. You will be bringing the decision process under your roof where you have a greater chance of influencing it. It is difficult to make radical change during a recession – we all think we will need what we no longer have. But Darwin has already proved that change is the only viable option, hasn’t he? Find other ways to secure ‘once in a blue moon sales’ if you must. Those showrooms that do not de-clutter, create space & time for the consumer to buy in a relaxed way will, like the giraffe, reach the end of their evolutionary journey sooner than they might expect. What are your reactions to Scarlet Opus' forecast about consumers? Have you noticed the same? What successful examples of flooring retail experiences have you encountered? What about giraffes and flooring -and other categories- in our midst. Are you one? For more information about Scarlet Opus and trends, read the Scarlet Opus Trends Blog. 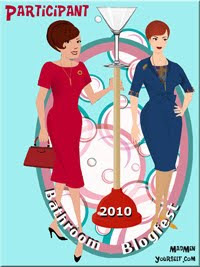 Will you be at Surfaces 2010? If yes, consider attending one or both of the sessions I'm leading on social media marketing best practices. I just published a press release with details: Whittemore Addresses Social Media Marketing Best Practices During Surfaces 2010. Register via this Surfaces link. By the way, Surfaces has recently launched a blog - the Surfaces Blog. Paul Friederichsen, one of my workshop co-presenters and president of BrandBiz, wrote the inaugural post titled "you're as good as the company you keep." His post gives you an overview of our Marketing in a Recession 101 workshop and the world we immersed ourselves in as we prepared. "Our session wouldn’t be complete without the third member of our trio: Christine. She’s everybody’s favorite expert on the Internet on how to utilize Social Marketing. It’s fascinating and ever so important nowadays to business success. Christine is one of my favorite people in this business – pure class. How she’s learned all this technical stuff, I’ll never know. But she also practices what she preaches, and she’ll show you how at our session." I hope you'll be able to attend one or both sessions. And, if you can't but are at Surfaces, please do find me to say Hi! I don't know about you, but I've been putting so much focus on 2010 - including remembering to write '2010' and not '2009' - that it seems strange to be reviewing 2009 activity. During December 2009, in addition to sharing Happy Holidays! 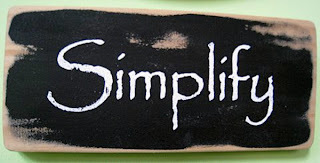 from the Chief Simplifier..., I wrote about several fascinating marketing presentations I attended. I'm still getting caught up on conferences and presentations from 2009 so expect more in 2010! In addition, I share Simple Insights, Social Media Marketing Recommendations and Simple Marketing News & Interviews. From the Fuel For Thought Series, Visual Goodness To Maximize The User Experience and Federated Media's Conversation Economy Examples. The latter relates to the John Battelle insights I shared with you from November. Although BRITE 09 took place in March, the speakers and presentations were outstandingly timeless. BRITE 09: Innovating During Downturns & Surviving the Worst will get you thinking creatively. 'Simple Sells' Discover Marketers. What have you encountered relating to simplicity? Here is the latest segment in my "How Do I?" series: How Do I Listen With Social Media? If you haven't recently, do check out my Simple Marketing Now website. I've added a page describing my blogs and done some additional tweaking and enhancing. I welcome your feedback. Thank you for reading, and Happy 2010! What's Your Take? Success or Waste of Time? I'm curious, though. What is the story behind this page? How long ago was it created? From the site, you can't navigate anywhere. Although the branding is related, it doesn't quite match up. So, how does it relate to the official HEMA web site? Is it primarily to create word-of-mouth buzz? 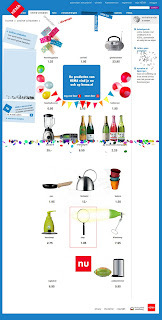 If you Google 'HEMA,' the goofy product page ranks first, ahead of the official website. And, the Wikipedia entry includes reference to it. + What's your take on this digital retail experience? + How do you think it enhances the HEMA retail experience? + Have you come across similar fun retail experiences? + Would you do anything differently?